Radiation levels remain as much as 10 times above normal in areas surrounding the plant, and scores of towns and villages remain off-limits despite a massive cleanup effort. “At first, I thought we would be gone a few days or weeks. Now, I’m not sure if we will ever go back,” said Kanno, 29. As Japan marks the anniversary of the March 11, 2011, disaster, officials concede that recovery throughout the region is lagging. 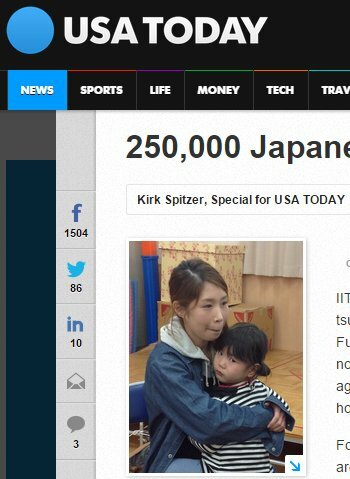 Nearly a quarter-million Japanese still live in temporary or interim housing. Hundreds of square miles of forests, farmland and townships remain uninhabitable because of radiation. Endless rows of thick vinyl bags filled with contaminated soil litter the countryside ? but represent just a fraction of the land that must be scraped up and hauled away before residents can return. At the stricken power plant, radiation is no longer escaping into the air, but workers are still battling to contain leaks of contaminated water. The plant won’t be fully decommissioned for at least three decades. Mercifully, no one has been killed by the radiation, and no illnesses have been traced to the leaks, so far. Yet even in areas declared safe, many evacuees are reluctant to return. They harbor a deep mistrust of officials after conflicting or hesitant evacuation orders early in the crisis, radiation readings that shift with wind and rain, and disagreements over the risks of long-term, low-level exposure. The magnitude-9.0 earthquake was the largest ever to strike Japan. It triggered a surge of water as high as 90 feet in some areas, washing away entire towns and communities along Japan’s northeast coast, killing nearly 16,000 people. More than 2,600 are still listed as missing. The one-two punch crippled the Fukushima nuclear plant and triggered a meltdown in three of its six nuclear reactors. The ensuing plume of radiation triggered full or partial evacuation of an area more than 18 miles away. Much progress has been made over the past four years. Virtually all quake and tsunami debris has been hauled away. Tens of thousands of temporary homes have been built. An interim storage facility opened in February that will accommodate the tens of millions of cubic yards of soil slated for removal. The International Atomic Energy Agency, which harshly criticized the plant’s initial reaction to the radiation leaks, issued guarded praise last month for recent progress toward decommissioning the reactors. Even so, a staggering amount of work remains. Completion of permanent housing for 230,000 evacuees has been pushed back to 2017 in some areas because of difficulty finding suitable land and shortages of construction workers and materials. The toll of the disaster is evident here in Iitate (ee-DAH-tay) village. Officials initially said the community, located about 19 miles from the plant, was safe from radiation. But just days later a general evacuation was ordered as radiation readings began to climb. Residents have been allowed to return to their homes and businesses during the day, but still cannot stay overnight or return permanently. The village had a population of more than 6,000 prior to the disaster, but now only a few hundred venture there during the day. “It’s eerie here now. There are all these houses and buildings, but at night you see no lights anywhere. In the daytime, wild boars and monkeys roam around like they own place ? and maybe they do,” said Muneo Kanno, who owns a farm in the village and heads a volunteer group that monitors local radiation. Radiation levels at the town hall have dropped to a level widely considered safe for long-term exposure. But Muneo Kanno (no relation to Yumi Kanno) said the radiation levels can fluctuate, and higher levels can be found in wooded areas not slated for cleanup. Government policy currently calls for decontaminating all homes and buildings in affected areas, as well as all farmland. But wooded areas will be left untouched. So residents and local officials will have to decide the level of exposure they are comfortable accepting, said Norio Kanno, the mayor of Iitate village. “People still do not understand everything about radiation and long-term exposure. Some people think it’s safe at a certain level, but others don’t. Are you OK as long as you don’t enter the forest? If you have children, are you willing to take that chance? I understand that people are reluctant to return,” he said. Satoru Mimura, a professor of disaster awareness and international affairs at Fukushima University, said residents may not be able to return to Iiwate village for three to five more years ? if then.